Wow, if I read the reviews before going here I would never have gone! In fairness, I think they have new management now, a top bloke called Shaun who is the reason I've made it my regular watering hole. Eaten here a few times (it's near my work) and the food is pretty good pub fair. The time to go is on Friday from 8pm when they have a young traditional Irish music band play every week. It isn't advertised in the pub so when they start playing everyone looks pretty shocked! But then there's a total party atmosphere. Clapping and dancing and everything. It's amazing! This is why I love London...so random. On my visit a couple of Saturday�s ago Pride, IPA and Explorer were available with another couple of pumps being off. My Stella wasn�t the greatest as I think the lines could do with a good clean. The landlord was friendly enough without being overly interested in our custom. The inside of the pub is a room with seating around the sides and a plasma screen showing Sky Sports at either end. It isn�t the cosiest of places and has a social club feel to it. There is some limited outside seating. 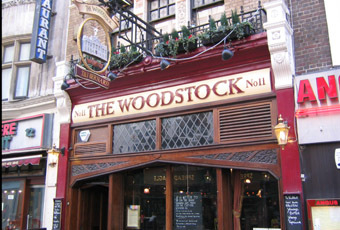 I�d maybe pop in if passing after a long shopping trip, but wouldn�t make the effort to cross the road to drink here.